What is the problem with sugar-sweetened beverages? Sugar-sweetened beverages contain a lot of calories and sugar and often provide little to no nutrition for your body. Some beverage companies add vitamins to make you think that the drink is healthy when in reality it has just as much sugar as other sugar-sweetened drinks. In addition to high amounts of sugar, these beverages also have a lot of calories. Even though you take in a lot of calories when you have a sugar-sweetened drink, you likely do not feel full afterwards compared to how you would feel from eating a healthy snack that has the same amount of calories. The added calories from these beverages can lead to weight gain and diseases such as type II diabetes. How much sugar is recommended in one day? The American Heart Association recommends consuming less than 25 grams of added sugar per day. 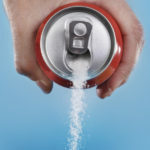 Often, sugar-sweetened beverages contain more than this amount causing people to take in much more than the recommended amount of added sugar in a day. Added sugar is sugar that has been added to something like to sweeten a beverage instead of naturally-occurring types of sugar that you would find in milk or a piece of fruit. How much sugar is in this drink? To figure out how much sugar is in a beverage, first look at the Nutrition Facts Label. Next to sugar, there will be a number in grams (g). Take that number and divide it by 4 to find the number of teaspoons of sugar in that drink. For reference, a sugar cube or packet, like you would find in a coffee shop, are both 1 teaspoon of sugar. As an example, think about a 20 ounce bottle of Coca-Cola. This drink has 65 grams of sugar in the whole bottle. 65 / 4 = 16.25 teaspoons (or packets) of sugar! That means that this one bottle of Coca-Cola is more than double the recommended amount! Juice, especially 100% fruit juice, can be confusing because it seems like a healthy choice. It is true that with 100% fruit juice there is no added sugar. However, 100% fruit juice contains just as much sugar as other sugar-sweetened beverages. If you think about drinking apple juice versus eating an apple, eating the apple is the healthier alternative. Why? When juice is made, fiber, vitamins, and minerals that are naturally present in the fruit are often lost. Juice is a condensed version of fruit. Eight ounces of orange juice contains about 4 oranges. Eating 4 oranges would take some time because you would need to peel them, chew, and swallow. Not to mention that you would likely feel full after eating 4 oranges! Eight ounces of juice, however, would not take long to drink, and your body would absorb it very quickly so you would likely feel hungry soon afterwards. The fiber and naturally present vitamins and minerals make whole fruits a better choice than fruit juice. Other juices, fruit punch, or smoothies that are not 100% fruit juice often have additional sugar added in. What are alternatives to sugar-sweetened beverages? Instead of drinking a sugar sweetened beverage, try drinking water! If you want to add a bit of flavor, think about a sugar-free flavoring such as Crystal Lite or Mio, or adding real fruit such as berries, watermelon, or lemon to your water. If you enjoy the carbonation in beverages, try seltzer or sparkling water instead. You can even try a splash of 100% juice in seltzer for some extra flavoring. Sparkling water is often naturally flavored and contains zero calories or sugar. Drinking low-fat dairy or dairy alternatives (such as soy milk) can help you meet your calcium and protein needs. It can be tough to cut back on sugar-sweetened beverages, especially if you are used to drinking a lot of them each day. Try to cut back on these beverages one at a time so you can make a long-term change.